$15 per workshop, OR $40 for the weekend. To Register, Click on the “Donate” button. Be sure to note your name, phone number and “Mestre Silvinho Workshops”. 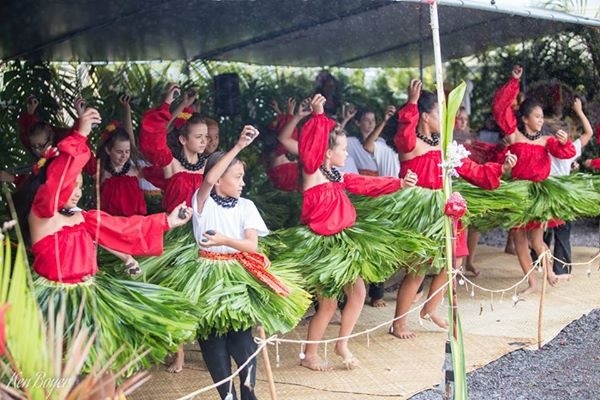 Explore the movements, music and history of two rich oral traditions: Hula and Capoeira. This one week Fall CAMP is for keiki ages 6 – 16. 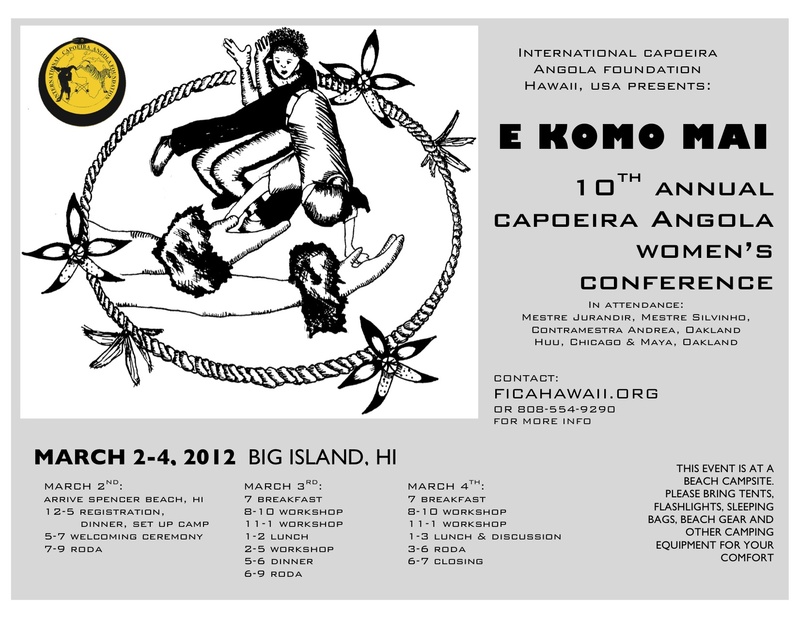 Kumu Hua will lead workshops in Hula and the International Capoeira Angola Foundation (Kumu Criss, Trenel Joe) will lead workshops in Capoeira. Students will showcase what they have learned at the close of the camp on Friday. $100 for the week, includes a daily fresh fruit snack. Space is limited to 20 participants. Register early to secure a space. plus… Storytelling, Circle Games, Art Activities and Student Showcase! 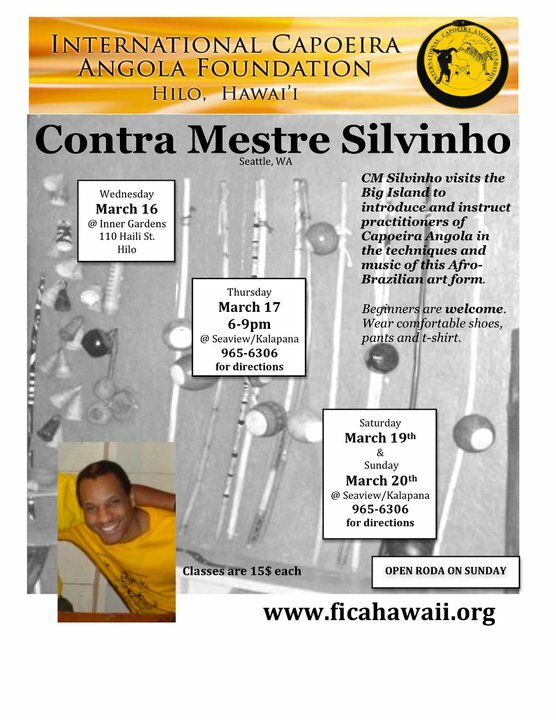 Mestre Silvinho is visitng from Seattle and will be leading classes in the movements, music, and traditions of Capoeira Angola over the September 13-14 weekend in Pahoa, HI. Beginners as well as experienced capoeiraistas from any and all backgrounds are welcome and invited to attend. It is always a pleasure to train and learn with M. Silvio, and we are excited to welcome him back to the Big Island! Thursday, Feb. 21st at Whole Person Healing Collective in Hilo at 6:30pm-8:30 pm on Haili St.
*Classes are all levels and all ages. 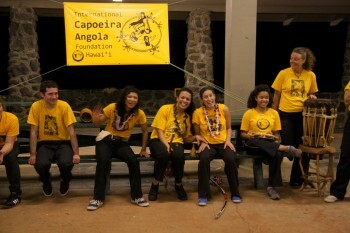 Thursday, Oct. 18, 2012 beginner class, 5:30-6:30p, Workshop, 6:30-8:30pm, in Hilo at Whole Person Healing Collective, 110 Haili St.
Come celebrate women’s presence in Capoeira Angola here on the Big Island of Hawaii. This event will be held at a beach park by the ocean. The accommodations will include, a place to camp, food and plenty of Capoeira. We encourage those of you, who have them, to bring tents and sleeping bags. But, we can provide some as well. Let us know on a case by case basis what your needs include. There are showers, bathrooms, electricity and covered pavilion for training. We can provide shuttle rides from the Kona airport starting Thursday. Any arrivals before then should fly into Hilo where most of us live. The cost is $75 for FICA and $100 for non-FICA members before February 1st and will include a free t-shirt. After this time cost will increase $25 dollars. Early registration is greatly appreciated in order to help pay for our special guests airline tickets. You can send your payment through paypal or mail a check. Special guests include Mestre Jurandir, Mestre Silvinho, Contra Mestra Andrea, Maya from Oakland and Huu from Chicago. Feel free to email or call us for more questions. Aloha. 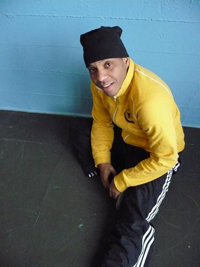 *Thursday May 26, 6pm, in Hilo, at Inner Garden, 110 Haili St.
CM Alcione (Associacao Capoeira Angola Dobrada, Belo Horizonte) is an amazing Capoeirista/Sambista. This is a special opportunity for those who have interest. Mahalo to all who attended and participated Afro-Brazilian Cultural Exchange conference with Mestré Jurandir, Contramestré Silvinho, Treneu Daniel, Lisa Dixon & Jesse Seymore.! Check out our slideshow and article on the Fica DC blog! 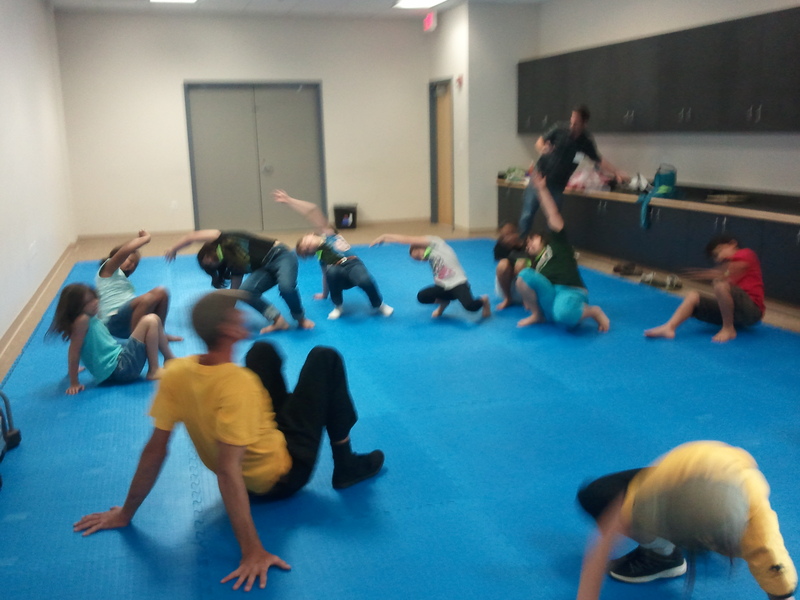 Thursday and friday classes held a the the EMAX at Kalani Honua near Kehena. Sat. & Sun. 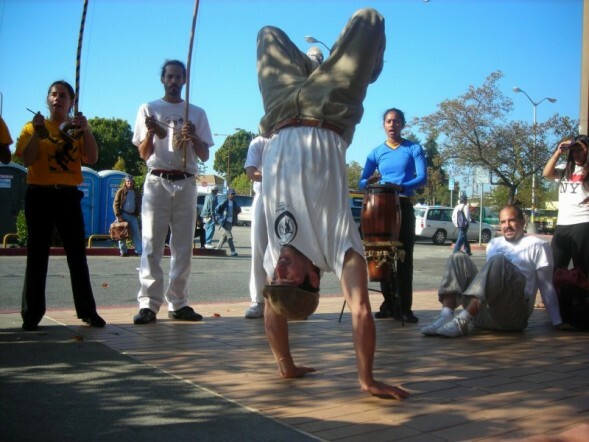 Classes at old Gym at UH Hilo off Kapiolani st.
*Saturday November 22nd @ The UH Hilo old gym 2:00 – 3:30 Introduction to the movement, & music of Capoeira Angola. 5:00-6:00 Tour of Hawaiian Sancturary sustainable agriculture with Sky Makai. 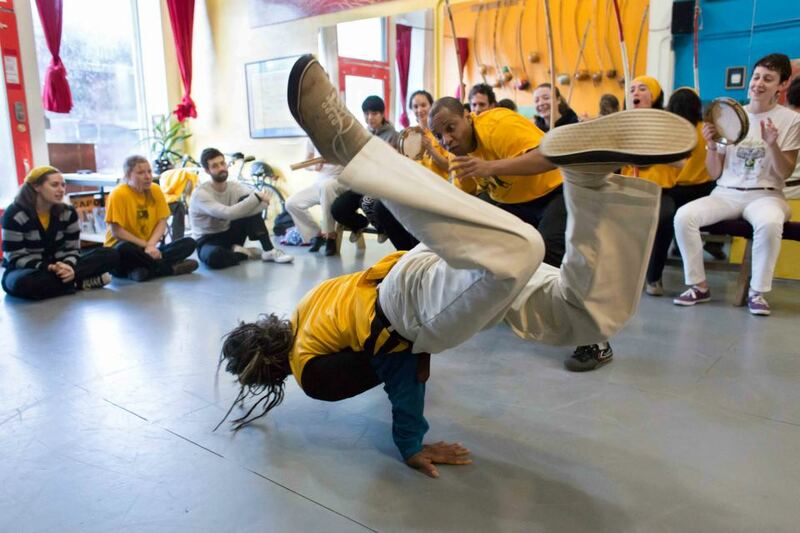 6:00-9:00 Capoeira Angola Music & Movement workshop followed by closing roda.